Νέες περιπέτειες στο δραστικά βελτιωμένο πλέον No Man’s Sky. Η δημιουργός Hello Games ανακοίνωσε το The Abyss update του No Man’s Sky, το οποίο φέρνει στο παιχνίδι υποβρύχια περιβάλλοντα με μεγάλη ποικιλία προς εξερεύνηση, νέα σχετικά οχήματα, βελτιωμένα γραφικά βυθού, αλλά και στοιχεία τρόμου. Το The Abyss update του No Man’s Sky είναι πλέον διαθέσιμο. Δείτε παρακάτω τις βασικές προσθήκες και trailer και πείτε μας αν θα ασχοληθείτε! • Aquatic Missions and Narrative: A new story, The Dreams of the Deep, brings a new context to the depths and a dark narrative to No Man’s Sky. Players are invited to discover the fate of a troubled crew stranded from a freighter crash by the rising tides or explore underwater ruins to uncover the tale of a lost soul trapped deep beneath the waves. • Submarine Vehicle: Master the depths of planets using a new Exocraft, the Nautilon. This submersible vehicle gives new meaning to underwater navigation, combat and mining – and can be summoned to any ocean on the planet, as well as docked at underwater buildings. 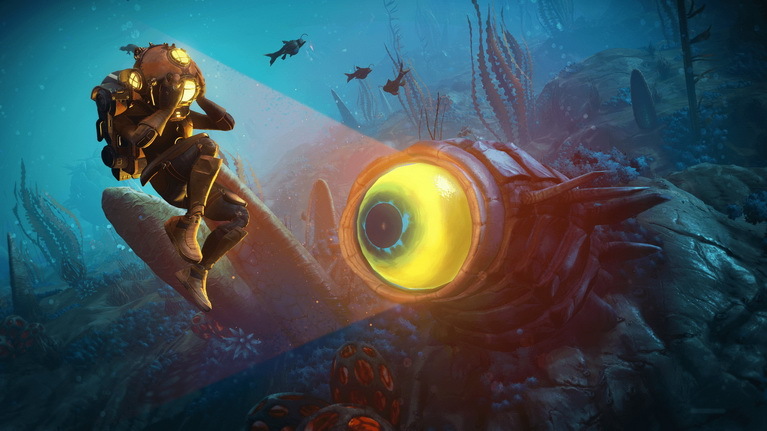 Players can upgrade the submersible with installable Submarine Technology and customise the Nautilon to stand out from their fellow explorers. • Submersible Building Modules: More than a dozen new base parts have been added to unlock more creative possibilities underwater. Players can construct the new Marine Shelter for brief respite from the oceanic pressure, and use its protection to reach new depths. New glass corridors, viewing bays and multi-storey submersible view domes provide travellers the perfect view of the surrounding ocean. Players can now bring their aquatic life into a habitat with a decorative indoor aquarium. • Flora and Fauna: The variety and visual quality of underwater biomes has been greatly improved. Players can now experience rare exotic aquatic biomes as they explore new depths. Underwater creatures have become more frequent, and more interesting. Aquatic life inhabits the full depth of the ocean, and unique terrifying creatures can be encountered on the ocean floor. • Sunken Wrecks and Ancient Treasures: Investigate sunken ruins and find ancient treasures or dive to submerged buildings to find remnants of their lost occupants. Discover and scavenge lost cargo from gigantic freighter wrecks. Use the terrain manipulator to excavate treasures buried in the nearby ocean floor. Find and repair rare crashed star ships to restore them from the seabed to the skies.